In this stunning compilation of personal writings, third-party records, and other sources, you will find narrative fragments detailing the destruction that follows in the wake of an unnamed video game and a deadly, vicious, viral outbreak that may or may not be connected. My student-researchers recommend that you begin with Taylor Henderson’s personal blog site before proceeding forward. In it, you will find short discussions of a frightening video game and the psychological deterioration that follows. Given the mounting evidence, the students in charge of this project believe that she is Patient Zero. 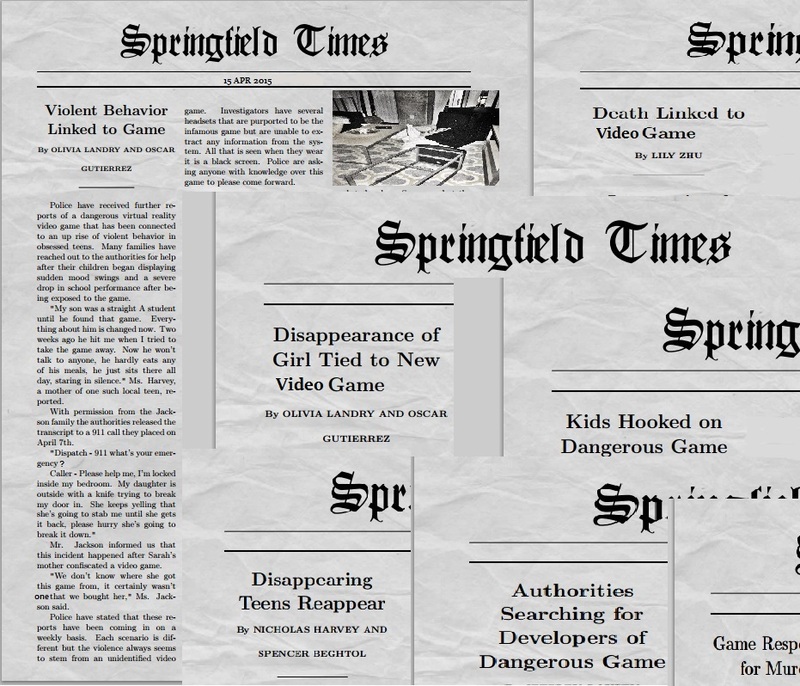 They have also collected Melvin Rodgers’ essay, “Teenage Wasteland,” which discusses the implications of Henderson’s posts, psychiatric observations related to a separate victim, research transcripts about a third teenager, and a coroner’s report detailing the biological conditions and consequences of a patient with no explicit connection to the video game in question. Perhaps some of you are visual learners, in which case you can take a look at this crime scene photo and these newspaper clippings. If, dear reader, you have information related to any of these incidents, I encourage you to leave a message or to contact the students in charge.